» Forum » All Pinside » Website » instant-email-notification possible for responce in a thread? » instant-email-notification possible for responce in a thread? instant-email-notification possible for responce in a thread? I dont find how do i get email message on Threads which i marked as favourite if there are new posts? Unfortunately, it is not currently an available feature. it is a pitty. This is a basic feature .In Europe I dont know any forum who do not suport this. I am suprised as pinside exist already so long time. Just check-in every day and look in "topics in which you posted"
For example i would like to be informed if there are new hotel blocks for pinburgh. In Germany I am in minimum 10 different Forums active. In all you can subscribe to Threads. Means if someone answer, you get email notification on first post of any user. Of course you get only one notification even if there are 10 new posts. Only if you go online you get new notifications. Sometimes it happens that 12 month later you get notification if someone write something. Would you check 12 Month later if there is any posts in a thread that you even forgot? on how many threads did you subscribed and espect every day a reply? How do you use this forum to know if someone answered on a post? You check it always again and again? Is there any plans to get notify on new posts? Yep, almost there! We're in the final stages of testing our new notifications system + app. Very good news, a new feature eagerly awaited. 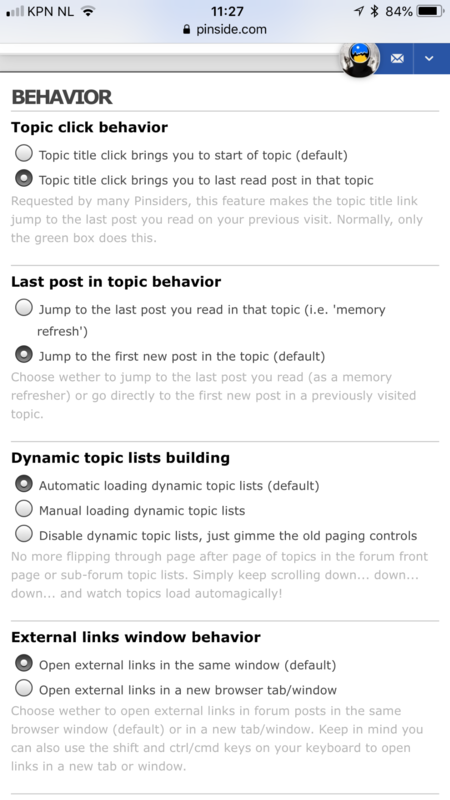 Are there oter posibility to continue on last readed post of "Topics marked as your favorites"? Is there a posibility for next time just to continue #533 without knowing last read was #532? Please make sure the default is to not have this "feature" engaged.